Barely 24 hours after he was released from prison, the leader of the Biafra Zionist Federation, BZF, Barr. 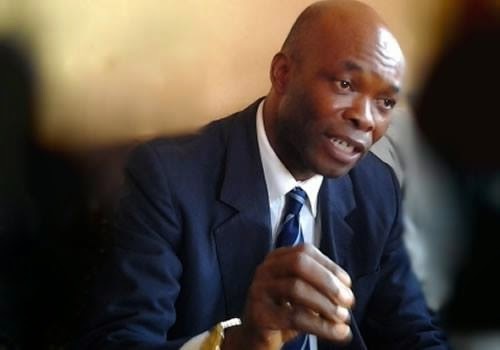 Benjamin Onwuka has vowed to restore the Republic of Biafra by March 15, 2017. Onwuka had three years ago stormed the Enugu Broadcasting Service with intention to make a live broadcast, in order to declare Biafra. But midway, security operatives acting on a tip-off, stormed the broadcast station and rounded up twelve of the BZF members, including Onwuka. ‎He was, thereby, incarcerated for three years. However, few hours after regaining his freedom, Onwuka, exuding much confidence, told journalists at a press briefing in Enugu on Tuesday that there was no going back on Biafra. He stressed that the re-enactment of Biafra Independence stemmed from the diplomatic relations his group, the BZF, had establised with America, the Great Britain and some other world powers. “The state of Biafra will be announced on March 15, 2017 by the Zionist Federation. I, Ikedi Benjamin Onwuka will be leading Biafra. I will be the President of Biafra. “The work we have done underground permits that America will endorse the Independent state of Biafra in March 15, 2017; we expect that this will come with the endorsement of President Donald Trump”, he stated. Onwuka further claimed that ex-President Barrack Obama of the United States of America, approved the policy for an independent state of Biafra on October 15, 2014 and also garnered support for Biafra from Great Britain, France, Israel, Russia and some other world powers. He said it was incumbent on President Donald Trump to implement the action “since a siting President in America usually do not ignore foreign policies established by their predecessors. “My confidence on President Donald Trump endorsing the restoration of an Independent state of Biafra hinges on the fact that ex-President Barack Obama made the approval. He attributed the failure to realize the Biafra project in 1967 by the late Biafra leader, Dim Emeka Odumegwu Ojukwu, to lack of diplomatic relations with world powers. On the perceived friction among the various pro-Biafra groups, he said:‎ “There will never be a day when all the pro Biafra groups will agree on every issue but the ‘Zionists’ have taken the upper hand because we established diplomatic ties with America, Great Britain and other world powers. “The MASSOB, the IPOB and others are under the zionists; the IPOB for instance has never gone beyond River Niger. All that Nnamdi Kanu is doing is to be insulting everybody through his radio; he is not even sparing America and Britain. So, you can even see that his actions are inimical to the Biafra dream. Onwuka disclosed that the new Biafra territory stretched beyond South East zone and Niger Delta regions to include Kogi, Benue, Nasarrawa states and many tribes in the middle belt. “Also the maligned and maltreated people of Southern Kaduna, several enclaves within the Federal Capital Territory, FCT, Abuja, including Seme Boarder in Lagos state to parts of Cameroon are part of us”, he claimed. “It is going to be a Biafra nation for all. The Igbo tribe will not dominate the Ijaw or Igala tribe. There will be no discrimination. It will be a government of all. No person or region will have an upper hand. There will be free press. It is the bedrock of democracy. “All those who died in the struggle will not be forgotten. Those who laid down their lives in the Biafra struggle paid the highest price. We would look for their families and take care of them”, Onwuka stated.